At Ethical Marketing Service we believe firmly in exceeding customer requirements, as without our clients we don’t have a business. As such, we insist on finding all about your business and your customers. It is less efficient to base our work on statistics alone, so this information is vital to complete optimisation. We want to know what is important to you and how your success is measured. Are we focusing on generating leads or sales? Or are we increasing your brand awareness? Either way, the best results are achieved if we know your target market. Ethical Marketing Service are different in many ways to other agencies. We believe in honesty and transparency, we will tell you what we expect to make a success and what would have challenges and could drain a budget. We will always work hard to get results and won’t get complacent, even campaigns working well can always be improved. We want your account to be a success, and we are not happy until you are. We want you to be getting a return on your investment to ensure the stability of our business and yours. Expertise across different markets and fields with our high volume customer portfolio. Company-wide dedication to get results. A Relationship Manager, equally determined for your advertising to be a success. We provide a full range of Digital marketing services. Platform to log in and listen to calls to your business. 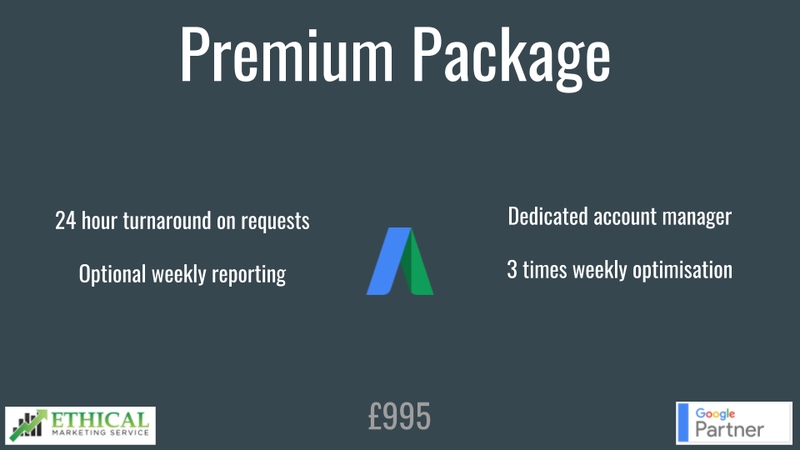 It really is risk free as not only do we offer a satisfaction guarantee but Google offer have great offers for new clients, such as spend £25 on a months advertising spend and get £75 free. You can really try it out with very little cost. An extensive account set-up is free when you join us. If you have any questions please call us for a no obligation conversation about your needs. Our first actions on handling your account is a full audit. Our team will analyse the account and use our expertise to refine it. 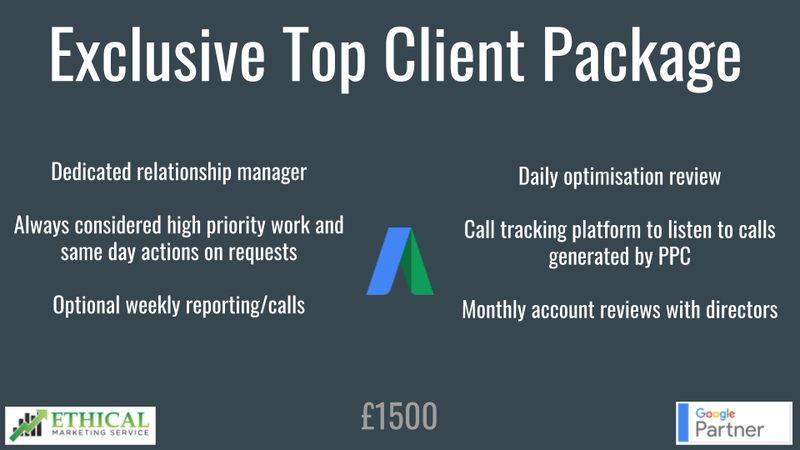 Most agencies will tell you it takes 3 months to get results. If you have an account already, then you should have data available that makes this “advice” inaccurate. The same agencies will also advise you that you will need to increase the budget to get results. This is equally untrue. At EMS we are the experts at making the most of what budget you have. We are happy to have a free no-obligation chat about your account and needs. 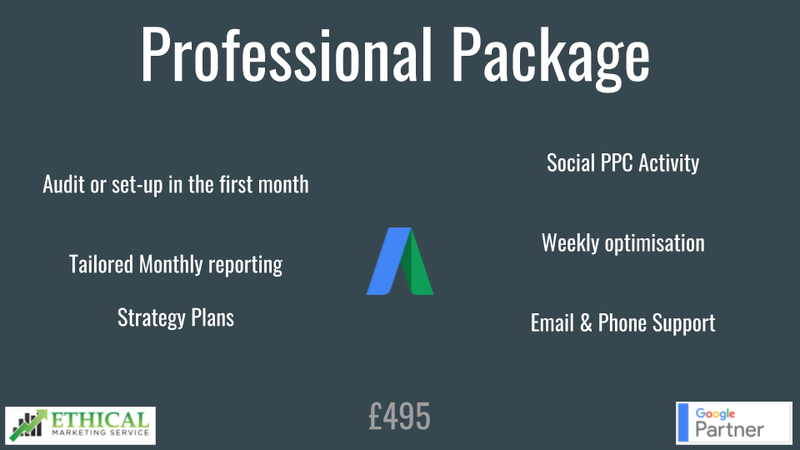 If you would like to discuss our services in more detail, or would like to speak to one of our PPC experts, email us at info@ethicalmarketingservice.co.uk or complete the contact form on the contact us page. 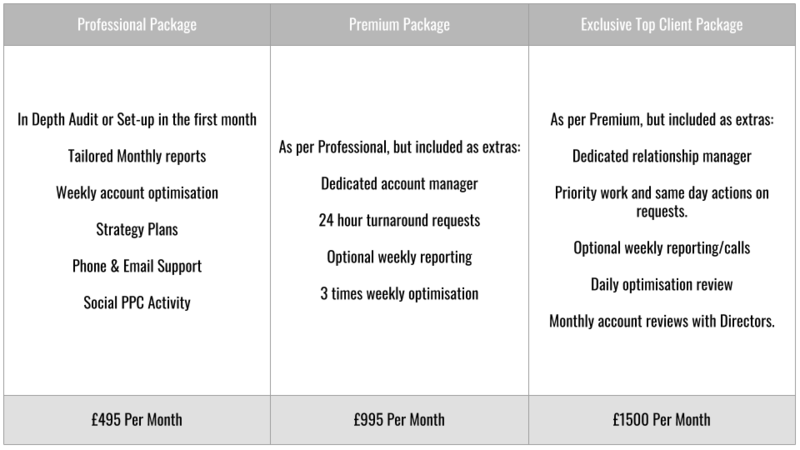 Our prices exclude any ad spend which should be considered when choosing which package to go with.